Gorgeous Hyundai HND-9 Venace concept was unveiled in Seoul last year, but who knew? While building a gallery of the bizarre cars on display at the Indian Auto Expo 2014, I came across a few photos of the Hyundai HND-9 Venace, and my mind was blown. Why hasn’t Hyundai been promoting the bejesus out of its amazing sports luxury coupe concept? With its elegant supercar looks, impossibly sleek lines, and the obligatory butterfly-style doors, it’s absolutely stunning. 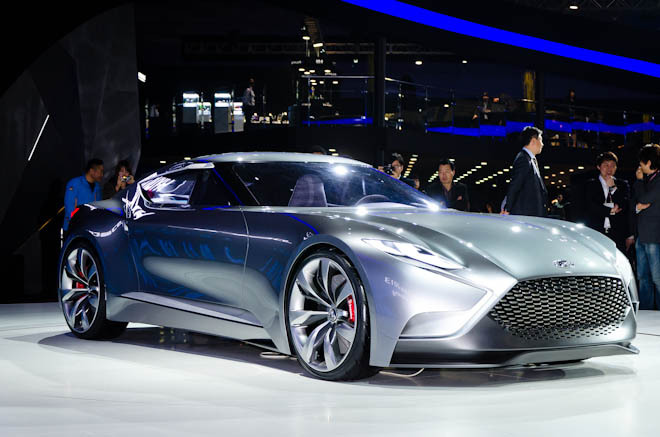 My guess is that the Korean automaker didn’t want to steal the thunder away from its handsome all-new and going-into-production-soon 2015 Genesis, which itself took styling cues from the even more captivating HCD-14 Genesis concept that was all the rage last year. The dramatic Hyundai HND-9 Venace concept was unveiled to the world last year at the 2013 Seoul Motor Show and was built to showcase a new design direction for the brand. When the HND-9 was unveiled, it was powered by a 3.3-litre turbocharged direct-injection gas engine and eight-speed automatic transmission. The coupe would output 365 horsepower and sit on giant 22-inch alloy wheels. Hyundai, if you make this car, you’ll be a hero. I’ve never been this excited about a Hyundai before.